Over/Under: Under 156.0 at 1.90 Bet Now! The hosts are on a terrible run of form, having lost 8 games in a row, and they know that they won’t be enjoying European basketball after the regular season of the Euroleague ends. This isn’t quite the case for Zalgiris though with the team from Kaunas still in the running to make it through to the next stage of the tournament. A tremendous win over Panathinaikos last week has lifted Kaunas spirits and they are currently sitting with an 11-14 record, a record that sees them sitting two wins outside of the playoff spots. When these teams met earlier in the season, it was Kazan that grabbed the win in Kaunas, picking up an 80-88 win. There was a massive showing from Art Parakhouski and Keith Langford who combined for a total of 50 points in the game. Langford remains the leading scorer in the league, with a 22.3 points per game, record but he had to sit out the game last week for Kazan. It is hoped that he will return this week but if he doesn’t, it will be a big blow for his side. Parakhouski has provided an average of 11.6 points per game this season while Quino Colom has also chipped in with an average of 11.6 points per game while also providing 5.6 assists per game. For Kaunas, hopes lie on Paulius Jankunas, with an average of 13.3 points per game and Brock Motum, who has chipped in with an average of 11 points per game. If these two players find form, there is every chance that the away side will avenge the defeat from earlier in the season and will keep their playoff hopes alive for another week. The hosts may not have a lot to play for but they aren’t going to buckle and let their fans down without a fight. 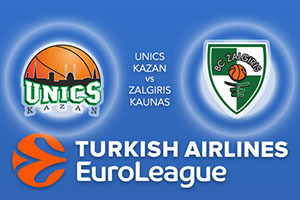 You can back Zalgiris Kaunas at +1, at odds of 1.90. If you’re looking for the Over/Under market, go UNDER 156.0 which you can find at odds of 1.90. Bet Now!